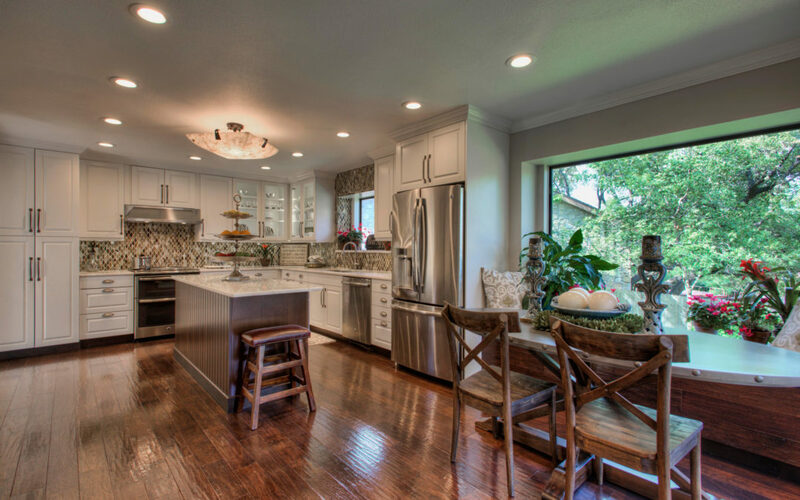 When it comes to making magic happen during a kitchen remodel, there is a lot that can be cooked up – there are oodles of options. There’s also a lot that can go wrong. Don’t try to remodel a 50’s ranch-style kitchen into a contemporary cook space. All homes, however humble, are built in a certain architectural style. Work with it, not against it. You’ll be spending too much money and time on complete overhaul, and you’ll end up with a kitchen that looks like it belongs in someone else’s home. If they’re quality wood and still in good working order, you’re in luck. This is one of the first things I check when sizing up a pre-remodel kitchen, since cabinet frames are the most expensive component of the entire space. It’s quite simple to give salvageable cabinets a face lift. Three common ways to repurpose and save thousands include: adding new doors and drawer fronts, re-laminating fronts and sides, or repainting – which leads us to……Don’t Just Paint – Spray Paint. Have all the cabinets cleaned and lightly sanded, then have a painter come in to spray them. Don’t try to DIY this one; a couple of cans of spray paint from the hardware store just won’t do the trick. A professional spray job can make ugly cabinets look factory-new. And you can’t get the same look by painting or rolling the cabinets yourself. ALL: What’s the one thing you’ve done in a kitchen (past or present) that really gave it that ‘wow’ factor?